The unique sweet and salty flavor of kettle corn has made it a sought-after treat at fairs and outdoor festivals everywhere. Because of its popularity, the sweet and savory snack is also available in many grocery stores in either a pre-popped form or a microwave-ready version. Popcorn is actually a nutritious snack, but the ingredients added to the corn can pack in excess calories and fat. Traditionally, kettle corn was popped in a large kettle without oil and then garnished with honey and salt. Granulated sugar began to replace honey in the traditional recipe once it became readily available in the mid-18th century to late 18th century. Today, most kettle corn recipes start with whole grain popping corn and contain oil, salt and sugar. Commercially available kettle corn contains approximately 195 calories, 7.5 grams of fat, 32 grams of carbohydrate and 1.5 grams of protein in a 3-cup serving. It also contains 195 milligrams of sodium, 9 grams of sugar and 3 grams of dietary fiber. A microwave version of kettle corn contains around 100 calories and 8 grams of fat per 3-cup serving. Kettle corn starts with plain popping corn, which is actually a healthy snack. According to the U.S. Department of Agriculture, a 3-cup serving of popcorn counts as a 1-ounce equivalent of whole grain. Popcorn is a good source of dietary fiber and antioxidants. Scientists at the University of Scranton found that popcorn hulls contain disease-fighting polyphenols, which protect your cells from free radical damage. 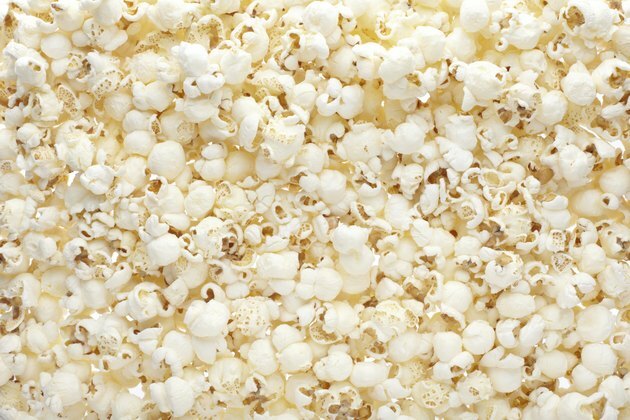 Popcorn is low in calories and fat, containing a mere 90 calories and 1 gram of fat in a 3-cup serving. The sugar, salt and oil that are added to make kettle corn considerably boost the calorie and fat content. However, kettle corn still has some nutritional value because the valuable nutrients found in popcorn. If you are looking for a tasty treat at the fair that's not going to leave you with a heavy dose of guilt, kettle corn may be one of your healthier options among all the deep-fried foods on the midway.